After a stellar debut in 2016, HondaJet is set to make an entry in the upcoming 2018 edition of Farnborough Airshow too. The jet closed 2017 with a bang with a tag of the most delivered jet in its category for 2017, based on numbers provided by the General Aviation Manufacturers Association. Honda Aircraft’s president and CEO, Michimasa Fujino, unveiled a new version of its light jet at EBACE 2018, the HondaJet Elite at a special hangar event ahead of the recently concluded 2018 European Business Aviation Convention and Exhibition (EBACE) in Geneva, Switzerland. The HondaJet Elite has achieved an extended range of an additional 17 percent (+396 km) and is equipped with a newly developed noise attenuating inlet structure that lines each engine and greatly reduces high-frequency noise to enhance cabin quietness. Additionally, the new aircraft’s advanced avionics system incorporates additional performance management functions for optimum flight planning and automatic stability and protection functions to enhance the safety of flight. The Elite is also more fuel efficient than any other aircraft in its category and emitting fewer greenhouse gases than similarly sized business jets. 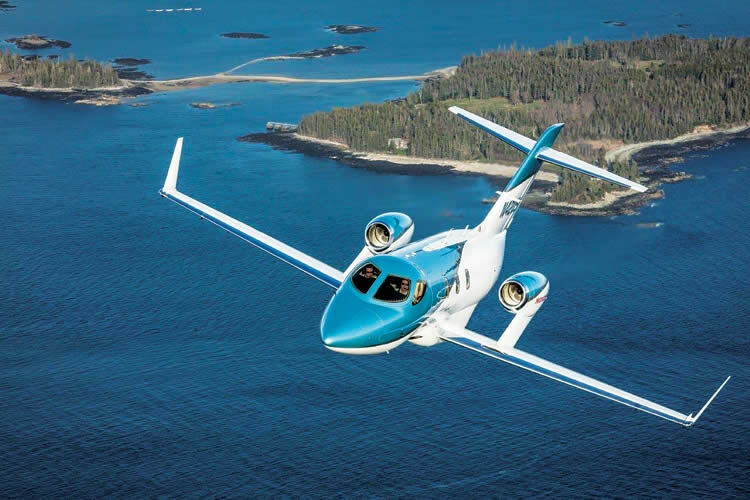 Fujino said of the latest addition, “The HondaJet Elite represents Honda Aircraft’s continued commitment to performance, efficiency, and environment creating new value in business aviation,” he said. “The result of innovation, design, and engineering, our new aircraft features several performance and comfort enhancements that, once again, set a new standard in aviation. We are excited to share Honda Aircraft’s latest technological feat with the world at EBACE.” He also revealed that the first HondaJet Elite will be delivered in August with a 17 percent range increase, a shorter take-off roll, and several avionics improvements. The HondaJet Elite has inherited the aeronautical breakthroughs developed by Honda Aircraft, including the Over-The-Wing Engine Mount (OTWEM) configuration, Natural Laminar Flow (NLF) fuselage nose and wing and composite fuselage. The aircraft continues to be the most efficient, quietest, fastest and highest-flying as well as the furthest-flying in its category. The original HondaJet already boasts class-leading speed, but the Elite upgrade reduces the advantages of rival Textron Aviation’s Cessna M2 in the areas of range and take-off performance. The HondaJet Elite also brings new upgrades for the cabin. A new noise-attenuating engine inlet is added to reduce vibration and sound inside the four-seat cabin. The cabin itself is now augmented by a lavatory with a belted seat, allowing a fifth passenger to be accommodated even with a galley. The Garmin G3000 avionics suite is also improved with several new features, including automated stability and angle of attack protection, as well as computed take-off distance. With its popularity growing at a breakneck speed, Honda Aircraft Company recently announced expanded sales to Japan with the appointment of Marubeni Aerospace as HondaJet Japan. 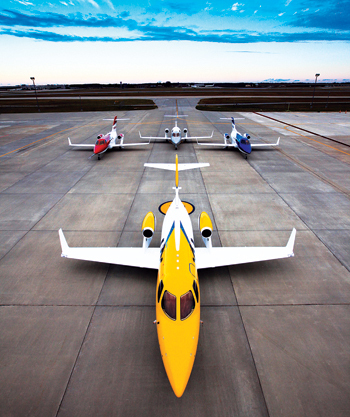 HondaJet Japan will provide sales, service, and maintenance of aircraft in the region. In May 2018, the application for JCAB type certification was submitted and the first aircraft is expected to be delivered in the first half of 2019. The Middle East also got a taste of Honda with the appointment of Jetex Flight Support as an authorized sales representative based in Dubai, United Arab Emirates. Honda Aircraft made the announcement at Palexpo during the EBACE 2018 in Geneva, Switzerland, where the HondaJet Elite is making its world debut. Jetex will represent Honda Aircraft’s sales in the United Arab Emirates, Saudi Arabia, Bahrain, Oman, Qatar, Lebanon, Pakistan, Jordan, Turkey, and Kuwait. Earlier this year, Honda Aircraft Company also announced that it has expanded sales of the HondaJet to India with the appointment of Arrow Aircraft Sales and Charters Pvt Ltd as an authorized sales representative based in New Delhi, India. Honda Aircraft made the announcement at Begumpet Airport during Wings India, where the HondaJet is making its first-ever appearance.